This is a scalable context timeline. It contains events related to the event April 5, 1997: US Again Not Interested in Sudan’s Al-Qaeda Files. You can narrow or broaden the context of this timeline by adjusting the zoom level. The lower the scale, the more relevant the items on average will be, while the higher the scale, the less relevant the items, on average, will be. Omar al-Bashir. [Source: PBS]In 1993, the US put Sudan on its list of nations sponsoring terrorism, which automatically leads to economic sanctions. 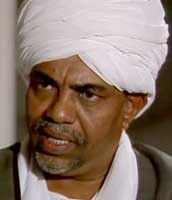 Sudanese leader Hassan al-Turabi espoused radical militant views, and allowed bin Laden to live in Sudan. But, as the 9/11 Commission later will note, “The Sudanese regime began to change. Though al-Turabi had been its inspirational leader, General Omar al-Bashir, president since 1989, had never been entirely under his thumb. Thus as outside pressures mounted, al-Bashir’s supporters began to displace those of al-Turabi.” In 1995, the US begins putting serious pressure on Sudan to deal with bin Laden, who is still living there. [Observer, 9/30/2001; 9/11 Commission, 7/24/2004, pp. 61] On March 8, 1996, the US sends Sudan a memorandum listing the measures Sudan can take to get the sanctions revoked. The second of six points listed is, “Provide us with names, dates of arrival, departure and destination and passport data on mujaheddin that Osama Bin Laden has brought into Sudan.” [New York Times, 9/21/1998; Washington Post, 10/3/2001] Sudanese intelligence had been monitoring bin Laden since he’d moved there in 1991, collecting a “vast intelligence database on Osama bin Laden and more than 200 leading members of his al-Qaeda terrorist network.” The files include information on their backgrounds, families, and contacts, plus photographs. There also is extensive information on bin Laden’s world-wide financial network. “One US source who has seen the files on bin Laden’s men in Khartoum said some were ‘an inch and a half thick.’” [Observer, 9/30/2001] An Egyptian intelligence officer with extensive Sudanese intelligence contacts says, “They knew all about them: who they were, where they came from. They had copies of their passports, their tickets; they knew where they went. Of course that information could have helped enormously. It is the history of those people.” To the surprise of US officials making the demands, the Sudanese seem receptive to sharing the file. This leads to a battle within the US government between top FBI officials, who want to engage the Sudanese and get their files, and Secretary of State Madeleine Albright and Susan Rice, her assistant secretary for Africa, who want to isolate them politically and economically. The National Security Council is also opposed. The US decides to increase its demands, and tells Sudan to turn over not just files on bin Laden, but bin Laden himself (see March-May 1996). Ultimately, the US will get Sudan to evict bin Laden in May 1996 (see May 18, 1996), but they will not press for the files and will not get them. [Washington Post, 10/3/2001; Vanity Fair, 1/2002] An American involved in the secret negotiations later will says, “I’ve never seen a brick wall like that before. Somebody let this slip up.… We could have dismantled his operations and put a cage on top. It was not a matter of arresting bin Laden but of access to information. That’s the story, and that’s what could have prevented September 11. I knew it would come back to haunt us.” [Village Voice, 10/31/2001] Vanity Fair magazine later will opine, “How could this have happened? The simple answer is that the Clinton administration had accused Sudan of sponsoring terrorism, and refused to believe that anything it did to prove its bona fides could be genuine.” [Vanity Fair, 1/2002] The US will continue to refuse Sudan’s offers to take the files (see April 5, 1997; February 5, 1998; May 2000). 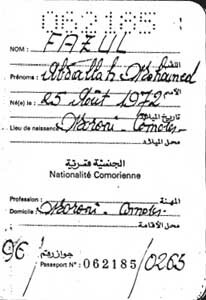 A photocopy of Fazul Abdullah Mohammed’s Comoros passport in Sudan’s intelligence files. [Source: Richard Miniter]Gutbi al-Mahdi, head of Sudan’s intelligence agency, sends a letter to David Williams, an FBI station chief. It reads, “I would like to express my sincere desire to start contacts and cooperation between our service and the FBI. I would like to take this opportunity with pleasure to invite you to visit our country. Otherwise, we could meet somewhere else.” Apparently the FBI is very eager to accept the offer and gain access to Sudan’s files on bin Laden and his associates. The US had been offered the files before (see March 8, 1996-April 1996; April 5, 1997), but the US position was that Sudan’s offers were not serious since Sudanese leader Hassan al-Turabi was ideologically close to bin Laden. But al-Turabi has lost power to moderates by this time, and in fact he is placed under arrest in 1998. There is a political battle between US agencies over the Sudanese offer, and in the end the State Department forbids any contact with al-Mahdi. On June 24, 1998, Williams is obliged to reply, “I am not currently in a position to accept your kind invitation.” Al-Madhi later will complain, “If they had taken up my offer in February 1998, they could have prevented the [US embassy] bombings.” Tim Carney, US ambassador to Sudan until 1997, will say, “The US failed to reciprocate Sudan’s willingness to engage us on serious questions of terrorism. We can speculate that this failure had serious implications - at the least for what happened at the US Embassies in 1998. In any case, the US lost access to a mine of material on bin Laden and his organization.” One of the plotters in the bombings is Fazul Abdullah Mohammed (a.k.a. Haroun Fazul), who is living in Sudan but making trips to Kenya to participate in the bombing preparations. Sudan has files on him and continues to monitor him. Sudan also has files on Saif al-Adel, another embassy bomber who has yet to be captured. Sudan also has files on Wadih El-Hage and Mamdouh Mahmoud Salim, both of whom have contact with members of the Hamburg al-Qaeda cell (see September 16, 1998; Late 1998; 1993). Salim even attends the same small Hamburg mosque as 9/11 hijackers Mohamed Atta and Marwan Alshehhi. Vanity Fair magazine will suggest that if al-Madhi’s offer had been properly followed up, both the embassy bombings and the 9/11 attacks could have been foiled. [Vanity Fair, 1/2002] It is later revealed that the US was wiretapping bin Laden in Sudan on their own (see Early 1990s). The CIA and FBI send a joint investigative team to Sudan to investigate whether that country is a sponsor of terrorism. Sudan again offers to hand over its voluminous files on al-Qaeda (see March 8, 1996-April 1996, April 5, 1997, and February 5, 1998), and the offer is again rejected. [Observer, 9/30/2001; Vanity Fair, 1/2002] The US will finally agree to see the files shortly before 9/11 (see July-August 2001).